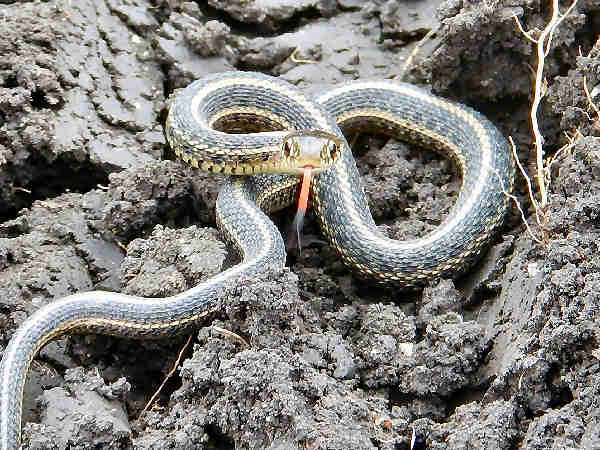 Minnesota’s northern climate translates into a lower than average diversity of Minnesota snakes. About seventeen species crawl the grounds and trees and swim in the state’s waters. The page provides pictures and descriptions of a sample of representative species. Please press the Snakes button on the left for additional snake pictures and identification help. Milksnakes are probably among the most recognizable snakes in Minnesota. They are generally medium sized snakes with colorful bodies. Eastern Milk Snakes (Lampropeltis triangulum) are very adaptable snakes, inhabiting multiples areas from fields to forests to farms. Finding them can be as easy as taking a hike and flipping over a few big rocks or logs. 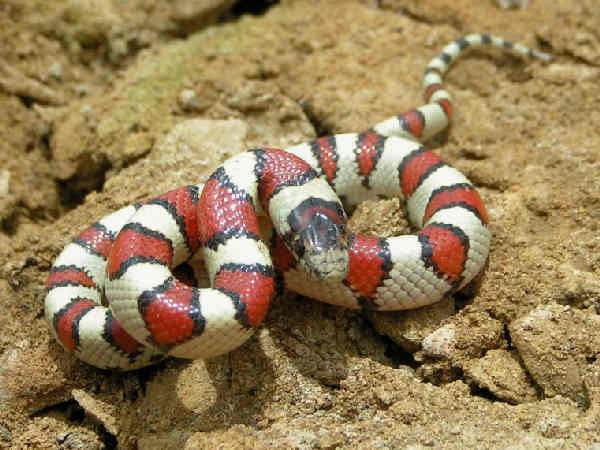 About eight subspecies of Milk Snakes are described in the United States. Minnesota’s milksnakes normally inhabit southeastern areas of the state. Along with Milksnakes, Garter snakes are another common and easy to identify snake. Minnesota hosts two. 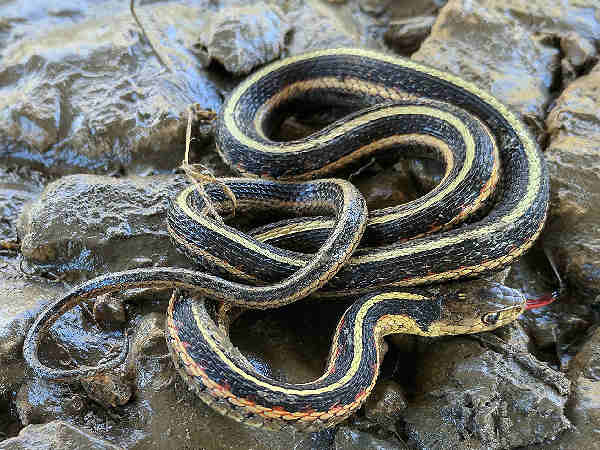 The first picture shows a Common Garter Snake. It’s a rather inconspicuous looking snake and it’s the primary species in most East Coast states. The dark top of the body is split by bold yellow strip and a hint of red can be seen beneath the top black section of the body. Plains Gartersnakes (Thamnophis radix), the second picture have the same general darker body top. The stripe pattern along the top of the snake changes slightly. Two Ratsnake species, the Western Ratsnake (Pantherophis obsoletus) and the Western Foxsnake (Pantherophis ramspotti), call Minnesota home. The picture shows the more colorful Western Foxsnake. 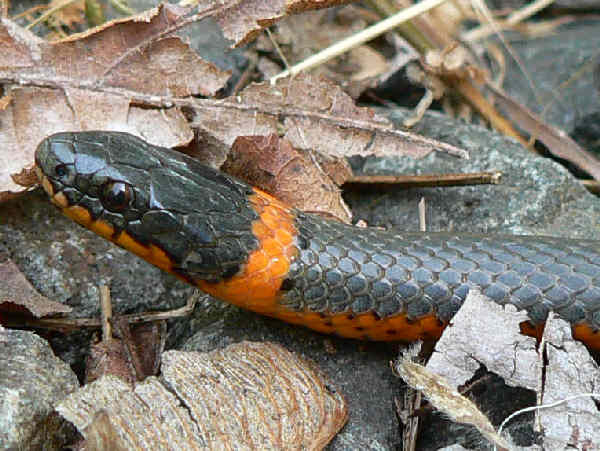 Minnesota hosts two, the Red-bellied and Brown Snake. 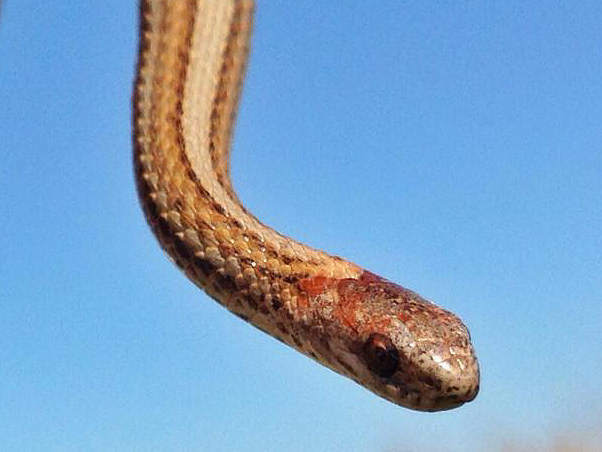 The picture shows a Red-bellied snake, probably the smallest snake in the state. It often grows to less than one foot in length. Sixteen Rattlesnake species in the genus Crotalus inhabit most areas of North America. Because of their venomous bites, their presence in any specific area usually gets well documented. 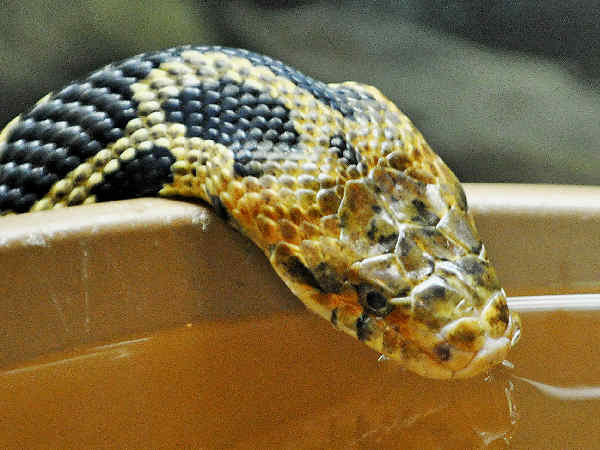 Minnesota hosts two ratlesnake species. 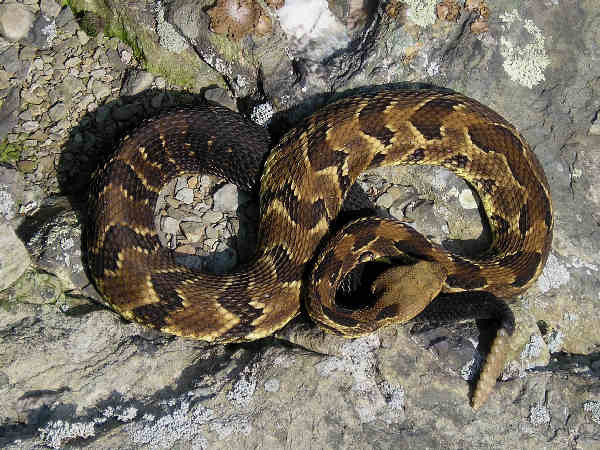 The Timber Rattlesnake pictured is probably the most common species in the United States. It lives in most states east of the Rocky Mountains. 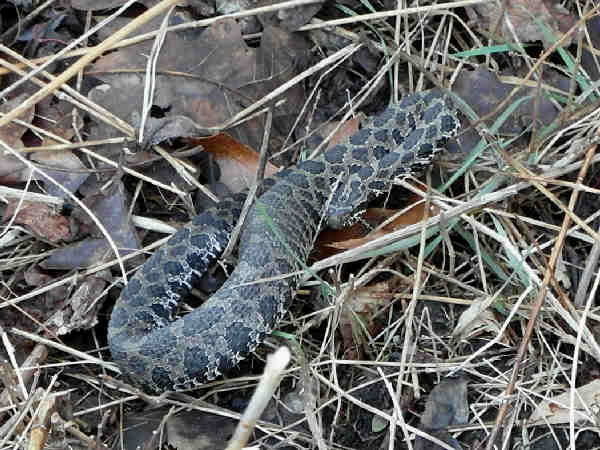 Eastern Massasauga (Sistrurus catenatus) are smaller snakes. Dark bodies are contrasted with even darker spots. The rattle is also present.